Open Source Learning. 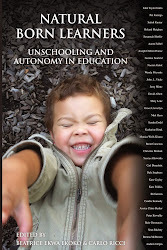 Autonomy in education. Self-directed learning/Unschooling. Open season on all things we might bump up against. Formally Radio Free School. This blog was started by un-schoolers at radio free school, a weekly radio show by, for, and about, home based learners. Ask me about Open Source Learning, Unschooling, Self-directed Learning and Autonomy in Education. Natural Born Learners: Buy the Book. You want learning to be regulated. Standardized. Average. Leveled. Predictable. And frankly not that exciting. So to have a movement where learning is unregulated, un-measured, unaccounted for is frightening. Nobody knows what they know except the learner- him or herself. Tests can't tell us because tests are not applicable in unschooling. Because you basically have to trust; which seems a very poor thing to go on-doesn't it? How else can you prove that learning is going on? With government regulation you get a sense or general idea of what the person before you is bound to know so that you can guess at how to relate to that person. And from there you can categorize him or her. It's safe this way; you know what is expected of you and most of all, you can fit in. Everybody is on the same safe, page. Do you see what is wrong with this picture? Someone creates the agenda. Someone has the power to decide what you should know and what should be omitted. Ask yourself, why is this be allowed to happen? Where what might have started out as a good intention, (namely giving kids the opportunity 'to get an education') what we have in place is a system that denies self autonomy to every single school child. The excuse is that there would be chaos and ignorance if schooling were not compulsory. I say that we already have ignorance aplenty (thanks to schooling) and that the way humans learn is actually chaotic-not in a linear fashion at all. Great post! I think this hits it on the head. In our ever-increasingly-reliant-upon-science world, an unmeasurable thing is a frightening one. We want to measure, classify, and standardize everything. Unschooling *is* frightening to most people, you're right. @Kim-thanks Kim. I think the biggest lesson unschooling teaches in independent thinking.As Illich said, an education should prepare us for surprises. 10 Unschooling Mistakes you want to avoid. Yes! Successful Unschooling: Say yes more!